Evelyn Petrova is tall, robust and beautiful. She performs sitting, but her performance is also a dance. Her powerful masculine body swings and sways, the huge accordion hops and leaps in her arms like a toy concertina. Her face grimaces, her voice shrieks and growls, screams and screeches. She’s a witch executing a shamanistic magic ritual, which sends shivers down your spine. She’s a primeval unhindered force and a sophisticated versatile musician. Raw, rootsy, sometimes almost vulgar primitivism blends seamlessly with free flowing ease of a jazz improviser and precision of a classical virtuoso. She grew up in a dull Soviet industrial town and came to St. Petersburg at 17 to study at Mussorgsky music school: straightforward academic training based on solid Russian classical tradition. Her next step upon graduation in 1994 was probably her most important one – she enrolled into Vyacheslav Gayvoronsky’s class of improvisation at Theatre and Music academy. Trumpet player and composer, Gayvoronsky, especially after Sergey Kuryokhin’s untimely death, was seen as an undisputed doyen of new and improvised music in St. Petersburg. For a few years in mid 90s Evelyn along with four other students of Gayvoronsky’s class was a member of his quintet. The quintet however didn’t last long and after a few sporadic performances mostly in St. Petersburg and after only one (though exquisite) record (Postfactum, SoLyd Records SLR0140) it was reduced to a duo – Gayvoronsky’s favourite format. A duo with Evelyn Petrova. They recorded two albums (“Chonyi Together” Leo LR … and “Homeless Songs” SoLyd SLR 0288) Evelyn was getting exposure she never had before and in 1999 a Russian jazz critics’s poll called her “a discovery of the year”. In the meantime she went on with her academic training and by 2002 she was a graduate of St. Petersburg Conservatory. 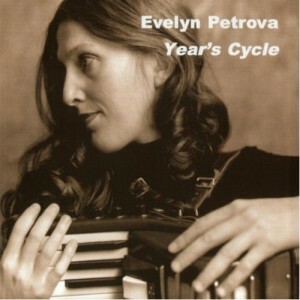 In 2002 following a brief spell in another duo – with cellist Viktor Sobolenko – Evelyn started playing solo.